Are you always staring at your phone and never at the sky? Do you worry that you never seem to notice the weather any more? Are you concerned that you do not hear the birds in the trees? That you seldom feel the grass under your feet or the wind in your hair? That the most vivid colours in your life come from a screen? When was the last time you sat on a beach and let the sand run between your toes? Followed footpaths across rich green meadows, inhaled the heavy scent of hawthorn hedges around their perimeter? Got lost in a wood at dusk and felt just a little bit scared? Do you check the weather in an app, or by the way it feels on your skin? Many people today feel divorced from the natural world. A good number blame it on their digital lives. Everything is too fast, everyone is too connected. It seems impossible to get away from your mobile, your tablet, your PC. But when you try to limit your online time, you discover something else to worry about: the fact is, you do not want to turn off your machine or leave your phone at home. You love them too much. That is where the guilt kicks in. But do we really need to disconnect from the internet in order to reconnect with the earth, sea and sky? I do not believe we do. That is what this book is about. Consider it an antidote to all those digital detox scare stories. Our workplaces are very different from a couple of decades ago, even probably just one decade ago. More of us are part-time, freelance, or employed on zero hours contracts. Many of us no longer work in factories, offices or shops, but at home in the kitchen, nomadically between cafes, libraries and gyms with free wifi, or in specially-designed collaborative offices created for self-employed start-ups. Quite a few of those spaces were repurposed from their earlier incarnations as banks, retail outlets and warehouses after they became defunct in the new economy. Indeed, some companies are now adopting similar kinds of free-wheeling models where employees can work flexibly at home or on the road. Our homes are often different too. We are no longer expecting to buy our first house any time soon. Instead, we are staying with extended family for longer, or renting a flat, or even perpetually travelling the world as digital nomads. Some of us are employed but homeless. Most of us do not have a place to plant and grow things. Our nearest patch of green may be a communal garden we are not allowed to tend, or a park the council can no longer afford to take care of. Most of us are urban. The minority who live in rural areas may have better access to the outdoors but be trapped there by lack of transport and and resources, such that proximity to nature is their least concern. In the heart of all this difficulty, attention to wellbeing in the digital age seems like a luxury most can barely afford financially, practically, or emotionally. But think of it another way. Depending on how you do it, connecting with nature can be one of the least expensive luxuries. And there are few experiences more restorative and rewarding. So can you find a way to make time for it? We know intuitively that nature is good for us. The wonderful sensations of the sun warming our skin or the icy kiss of snowflakes landing on our cheeks need no explanation. They remind us that we are alive, part of the planet we live on. Our DNA contains the history of the Earth and we are all, as cosmologist Carl Sagan said, made of starstuff. We know it in our bones. Yet, over several millennia we have worked to build a world designed to disconnect us from nature. We have made structures and materials to protect us from it; we have found ways to farm and cook its plants and animals; we have invented the wheel, stories, writing, music, pictures, and all kinds of manufacturing and processing methods. We have built ships, cars, aeroplanes, and space rockets and, in the last few decades, we built the internet. Then we added on Facebook, Twitter, YouTube, Microsoft Word plus, the very devil incarnate, the smartphone. So, now what? Some fear we have gone too far and soon we’ll be overcome by our own technology. They think that whether we are subsumed into a world run by robots, or superseded by superior intelligences, or simply blown up by our own stupidity… whatever it is, we have stepped over the line and will eventually pay the price. That is certainly possible. But it is not a reason to stop everything and try to turn back the tide. And it is very possible that far from separating us from the natural world, our phones, smart watches, tablets and PCs can bring us closer to it. Perhaps they will even help heal the rift between us and our planet. Many people have already discovered that virtual encounters with nature can be extremely powerful. Video games can transport us into wild yet often healing environments and even the humblest screen saver picture can bring calm to a moment of stress. For example, while you agonise over whether you need a digital detox, thousand of amateur farmers in windowless offices around the world are taking time out from a stressful day at the keyboard to tend their virtual tomato plants in Farmville. Elsewhere, Grand Theft Auto players explore gorgeous wild landscapes lit with a compelling natural beauty in real uncanny valleys. And 350 million photos are posted on Facebook every day. How many of those are of our own gardens and daily walks? Quite a few, I suspect. And here is another factoid — in 2016, image posts got 179% more interaction than the average Facebook post. That is the way of our digital lives today. But, remember, we are only at the beginning. The wired world is in its infancy and there is a lot to learn. We are still taking baby steps and sometimes we trip, it is true, but let’s not forget that the internet has brought us to the cusp of something amazing. It is imperative that we embrace it, but we must make sure that we do not lose touch with nature in the process. The dancer and craftsman Paulus Berensohn once said of his complex and dynamic work ‘it is not a way of making a living, it is a way of making a life’. It is the same with digital technology. We use it for making a living, yes, but we also use it for making a life. It took me a long time to realise that. I don’t live as well as I should. I am 65. In the last twenty years or so there have been very few days when I have not connected to the internet. I was born into one of the first generations to encounter the natural world through a TV screen, and I discovered the internet when I was 43. I have been online for a third of my life. In the early days, I logged on to the music of a dial-up modem, a tune which still thrills me whenever I hear it. It sounded like the revving of an aeroplane before take-off, or the engine of a car gathering speed. I couldn’t wait for the low vibrating dongg-dongg-dongg of the hardware handshake followed by a breathless pause until you knew for certain that you were online. In those days, connections were so fragile that every time it felt like leaping across a precipice and just hoping the other side would take your weight. As soon as I discovered cyberspace I knew it would become my muse, and so it has proved. Immediately, it felt like the home of my heart, the place where I could really be me, my own personal geography. I have written about it ever since. 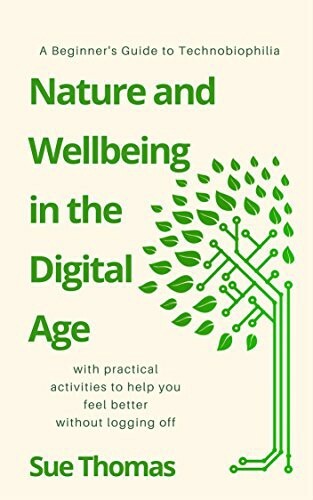 It has given me a career as a writer and academic, but it was only while researching my most recent book, ‘Technobiophilia: nature and cyberspace’, that I realised I needed to get my act together. I came to understand that I do not get outside enough; I do not connect with nature enough; I do not even touch the world enough. My gaze is always on a screen. My thoughts are always in cyberspace. I still love my wired life and I am not prepared to give it up, but I do have questions. Where are we headed? What should we be doing to ensure that our digital lives are healthy, mindful and productive? How can I connect to my body and to the world without breaking up with technology? I think I have begun to find some answers, but there is still a lot of work to do. Choose more nature, not less technology. Set your timer for 5 minutes, lift your gaze from your screen, and watch the sky until the timer goes off. When you’re looking for a new screen wallpaper, consider choosing a forest. Research has shown that pictures of dense groups of leafy trees are very calming. De-stress your digital life with something made from real wood — perhaps a mouse, a keyboard, or a smartphone case. ‘Nearby nature’ makes you healthier and happier. If you’re stuck indoors in front of a screen for hours every day, make time to enjoy small suggestions of the outdoors — pictures, videos, a green window view, even just a single pot plant on your desk. Take a trip into virtual reality to explore VR forests, plains, deserts, and oceans, and try video games too. Second Life has a wealth of landscapes to enjoy, and the mountains in Grand Theft Auto are stunningly beautiful all year round. Treat yourself to a cheap Google Cardboard kit or a fancy VR headset to open up whole new vistas. Originally published at suethomasnet.wordpress.com on March 25, 2017.